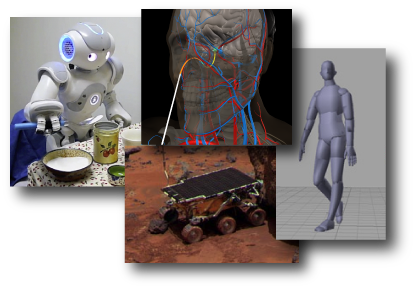 From enabling a robot to accomplish a chore to animating a character in a game, many tasks require planning the motions of real or virtual objects. Motion planning algorithms compute sequences of motions that achieve a particular goal, such as performing surgical tasks using medical robots, enabling self-driving cars, automating tasks in factories and laboratories, simulating character movements in games, animating character motions in movies, and using robots to assist individuals with tasks of daily living. Developing motion planning algorithms is both technically broad and theoretically deep, raising a unique combination of questions in algorithm design, computational geometry, control theory, and robotics. Prerequisites: Knowledge of undergraduate level calculus, linear algebra, and programming (any language, such as Java, Matlab, C, C++, etc.). Prior coursework in motion planning, robotics, or graphics is not required. Both graduate students and motivated undergraduate students are welcome to enroll.